After spending years trying to overcome safety fears and environmental objections, El Paso Corp. has withdrawn a proposal for a natural gas pipeline that would have run from the Bahamas to central Palm Beach County. The decision brought relief along the proposed land route, where neighborhoods had organized to fight the project. 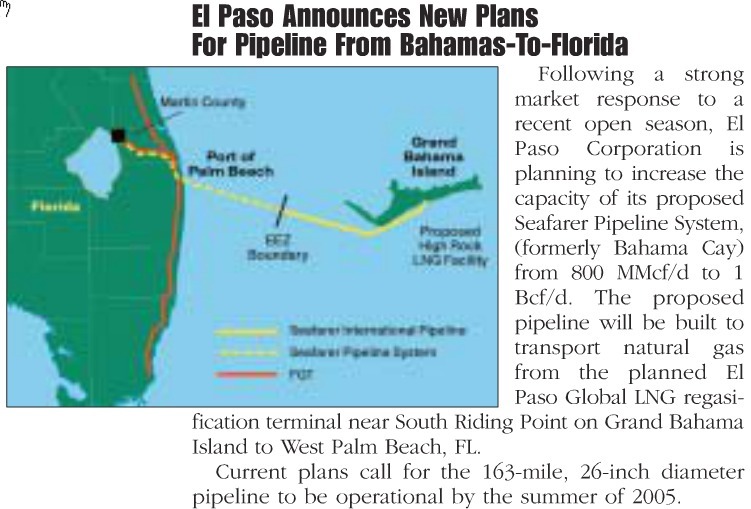 While El Paso has given up the fight, two other companies are still pursuing plans for Bahamas to South Florida pipelines, both intended to make landfall in Broward County. And it looks like at least one of those awaits only approval by the government of the Bahamas; see AES Ocean Express pipeline from Florida to Bahamas.